Back in the 1980s, when HBO had the comedy series Not Necessarily the News, they had a running gag on one episode about Ingmar Bergman where the punchline always was, "I think this represents death." My friends and I though this was funny, but we were early adolescents at the time and hadn't seen any Bergman films. 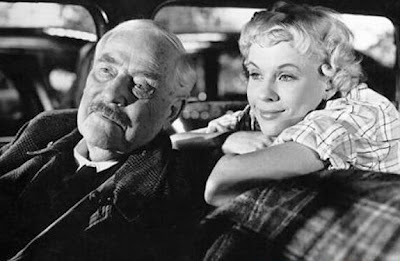 Now that I have, and I love a great many of them, I still giggle at the line even though I know it's an oversimplification, though death's spectre does hover over the aging life of Professor Isak Borg in Wild Strawberries, which opened in the U.S. 50 years ago today. In an interview, Bergman once said that by the time he was done making Wild Strawberries, the film really belonged more to Victor Sjöström, who played Borg. The film marked Sjöström's return from semi-retirement, but he already was a legend as the first true acting-directing star from the Swedish era. 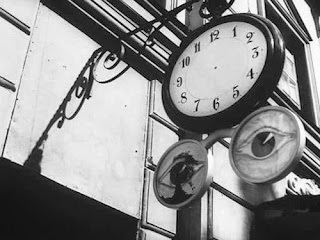 It's easy to see how Bergman came to that conclusion since Sjostrom is in nearly every scene of the film either by his presence or from the perspective of his eyes. The story of Wild Strawberries is a simple one: Borg, a renowned professor and once a lauded physician, is about to receive an honorary degree. On the morning of the event, much to the chagrin of his longtime housekeeper/nanny (Jullan Kindahl), Borg decides that he is going to drive his old Packard to the event instead of flying to meet his son. The journey is more than just a road trip for the professor, but a metaphysical trek through his past as he questions what led him to this moment. When we first meet Isak, he is writing at his desk, his faithful dog lying at his feet, contemplating how evaluating behavior forced him to withdraw into old age and loneliness and turned him into a man who preferred the love of science to that of human interaction. This semi-solitary life has begun to take its toll on Isak, as his dreams have become odder and more frightening (and evidence of Bergman's own love of German Expressionism). For the viewer, Isak seems a nice enough fellow, which is why it's a bit of surprise when the trip begins and he's joined by his daughter-in-law Marianne (Ingrid Thulin) who honestly tells him that she and her son (as well as others) view him as selfish and ruthless, hidden behind his charm and manners. Professor Borg seems particularly surprised, since he's been praised so much throughout his life, be it from a gas station attendant in a town where he used to practice medicine (Max von Sydow) who named a son after him) or from a trio of young hitchhikers who join the journey. The most interesting of the youths is Sara (Bibi Andersson) who also plays another Sara in flashbacks, a long lost love that Isak lot to his brother many years before. As the car winds closer to the ceremony, Borg's inner journey does as well as he comes to realize that for all his scientific training, the only thing he can't analyze is himself. "The day's clear reality dissolves into even clearer remnants of memory," he says at one point. The fact is that he feels as if he's a walking corpse and he wishes he could get that spark back, the spark he sees in the hitchhikers. I'd be remiss if I didn't praise the gorgeous black-and-white cinematography of Gunnar Fischer, who makes stunning use of light and shadows. 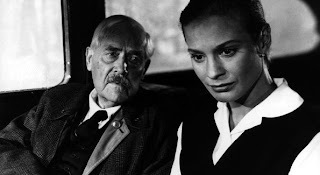 Wild Strawberries represents Bergman when he was really growing into his powers as a filmmaker and while it may concern a 78-year-old man examining his life, the subject is as timeless for people of any age as the film itself is.